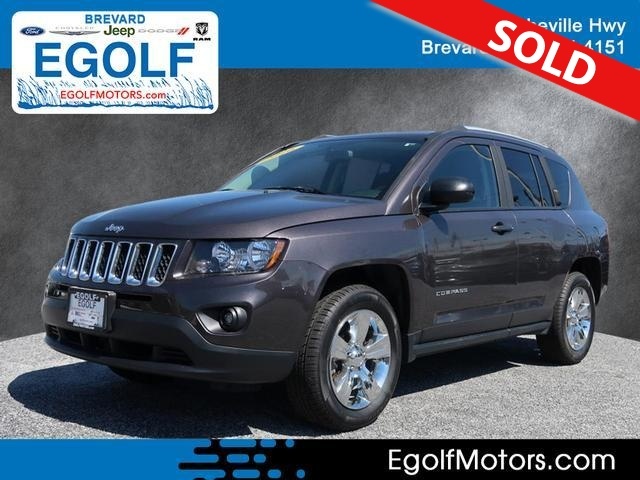 2016 JEEP COMPASS SPORT 4WD, AUTOMATIC TRANSMISSION, LOCAL TRADE IN, CLEAN AUTOCHECK HISTORY REPORT, POWER EQUIPMENT GROUP AND MUCH MORE. PLEASE CONTACT EGOLF MITSUBISHI SALES AND SERVICE 1325 SPARTANBURG HIGHWAY, HENDERSONVILLE NC 28792 @ 828-694-3600 FINANCING AVAILABLE FOR ALL CREDIT TYPES!!. Aside from its low price tag, there's little reason to consider the 2016 Jeep Compass given the excellence of its competitors. The range-topping Limited trim level has been dropped, and the Sport now comes standard with Bluetooth and satellite radio. The Latitude gets standard automatic headlights. A Sport SE appearance package replaces last year's Altitude package with similar content. Despite obvious shortcomings, the 2016 Jeep Compass continues to be a steady seller, just like its cheap-Jeep sibling, the Patriot. There's little doubt that the Compass' rock-bottom starting price has a lot to do with it. Those baby-Grand Cherokee looks certainly don't hurt, either, and the Jeep name has enduring appeal for many shoppers. But that doesn't change the fact that the Compass is largely subpar and outdated when compared to the competition. One of the 2016 Jeep Compass' few draws is its Grand Cherokee-lite exterior design. To be fair to the Compass, it will go farther off-road than most compact crossovers if you select the Freedom Drive II off-road package. To get that capability, however, you'll have to make do with the power-sapping and generally unpleasant CVT. The five-speed manual and six-speed automatic transmissions are more tolerable, but refinement isn't exactly a strong suit of any Compass configuration. Jeep's newer small SUVs, the compact Cherokee and the subcompact Renegade, just do it all so much better. And if you compare the 2016 Compass to the likes of the Ford Escape, Honda CR-V, Hyundai Tucson or Mazda CX-5, you'll get an instant reminder of how far we've come during this crossover's many years on the market. Yes, these models are more expensive than the Compass, but there's a good reason for that. They're worth it. The 2016 Jeep Compass is a five-passenger small crossover SUV available in two primary trim levels: Sport and Latitude. Two sub-trims -- Sport SE and High Altitude Edition -- add features to the Sport and Latitude, respectively. Standard features for the Sport include 16-inch alloy wheels (upgraded to 17s if the larger 2.4-liter engine is specified), foglights, roof rails, air-conditioning, cruise control, manual accessories (windows, mirrors and locks), 60/40-split folding rear seatbacks, a tilt-only steering wheel, Bluetooth and a four-speaker sound system with a CD player, satellite radio and an auxiliary audio jack. Options for the Compass Sport include the Power Value Group (full power accessories, heated mirrors, body-color trim, automatic headlights and remote keyless entry) and other option packages shared with the Latitude (see below). The Sport SE package adds 18-inch gray alloy wheels and matching gloss-gray body trim, a leather-wrapped steering wheel with integrated audio controls, heated front seats and upgraded cloth and vinyl upholstery. The Latitude starts with the Sport's standard features and adds the contents of the Power Value Group as standard, plus chrome exterior accents, silver interior trim, a height-adjustable driver seat, the Sport SE's heated front seats and upgraded upholstery and steering wheel, a 6.5-inch touchscreen infotainment system (with hard-drive music storage and optional navigation), reclining rear seatbacks and a 115-volt power outlet. The 2016 Compass is one of the only vehicles in the Jeep/Chrysler/Dodge lineup that gets the brand's old tech interface. The High Altitude Edition package, offered only on the Latitude, adds unique 17-inch wheels, a sunroof, additional chrome exterior trim, leather upholstery and a six-way power driver seat with manual lumbar adjustment. Other options unique to the Latitude include 18-inch wheels, a towing package and automatic climate control. The Latitude is also eligible for three additional packages. The Security and Cargo Convenience Group includes remote ignition, an auto-dimming rearview mirror, an alarm system, an upgraded trip computer, a USB port and voice controls. The Premium Sound group includes nine Boston Acoustic speakers (two of which swing down from the tailgate) with a subwoofer. The Sun and Sound group bundles the Premium Sound package with a sunroof. Both Sport and Latitude can be equipped with the All-Weather Capability Group, which consists of 17-inch wheels with all-terrain tires, tow hooks, daytime running lights, an engine block heater and all-season floor mats. Every Compass is additionally eligible for the Freedom Drive II Off-Road Group, which includes 17-inch wheels with all-terrain tires, an upgraded all-wheel-drive system with simulated low-range gearing, skid plates, a brake-lock differential, tow hooks, a full-size spare tire, a heavy-duty alternator, an engine oil cooler and (for the Sport) a height-adjustable driver seat. Finally, the Sport can be specified with the 6.5-inch touchscreen interface and rearview camera, though the navigation system is limited to the Latitude. The 2016 Compass' base engine is a 2.0-liter four-cylinder rated at 158 horsepower and 141 pound-feet of torque. A five-speed manual transmission is standard on the 2.0-liter Sport, while the 2.0-liter Latitude comes with a CVT. Front-wheel drive is mandatory with the base engine. The EPA estimates fuel economy at 26 mpg combined (23 city/30 highway) for the 2.0-liter Compass with the five-speed manual. The CVT drops those numbers to 24 mpg combined (22/26). Optional on front-wheel-drive models and standard with all-wheel drive is a 2.4-liter four-cylinder that produces 172 hp and 165 lb-ft of torque. The five-speed manual is once again offered on the Sport, but otherwise the six-speed automatic handles the shifting -- unless you specify Freedom Drive II, which substitutes a CVT with a crawl mode that simulates a 4x4 vehicle's low-range gearing. The Jeep Compass isn't the kind of Jeep you take off the beaten path, but Freedom Drive II offers some semblance of off-road ability. With the manual and front-wheel drive, the 2.4-liter Compass is rated at 25 mpg combined (23 city/29 highway). Add the six-speed automatic and you're looking at 23 mpg combined (21/28). With all-wheel drive, the 2.4-liter Compass returns 24 mpg combined (22/27) with the manual, 22 mpg combined (20/26) with the six-speed automatic and a woeful 21 mpg combined (20/23) with Freedom Drive II's CVT. In Edmunds testing, an all-wheel-drive Compass with the 2.4-liter engine and six-speed automatic went from zero to 60 mph in 9.4 seconds, an average time for this class. Standard safety features for all Jeep Compass models include antilock brakes, stability and traction control, front-seat side airbags and side curtain airbags. Front-wheel-drive models feature inferior rear drum brakes, while all-wheel-drive models get disc brakes front and rear. In Edmunds brake testing, an all-wheel-drive Compass came to a stop from 60 mph in 121 feet, which is a bit better than average for this class of vehicle. In government crash testing, the Jeep Compass received just three stars out of a possible five for frontal impact crash safety. The Compass got a much-needed interior upgrade in 2014, but we're still less than happy with the industrial-grade plastics. Moreover, in this day and age, it's exceedingly rare to find a vehicle that still comes with crank-down windows and manual locks as standard. That's something to keep in mind if you're eyeing a low-priced Compass -- it might not be equipped with the features you expect. Contrasting colors look great in photos, but the plastics feel cheap and chintzy in the real world. The front seats are comfortable enough and adequately supportive for longer drives, though the seatback cushions are a little narrow for larger adults. Rear legroom is tight for this class, reminding us more of a compact hatchback than a typical high-riding, airy crossover. In terms of infotainment, the optional 6.5-inch touchscreen is older and less user-friendly than the 8.4-inch "Uconnect" interface found in most other Jeep and Chrysler models. The Compass does offer some clever interior features, such as distinctive (and optional) speakers that flip down and out from the raised liftgate for beach parties and the like. However, the maximum cargo capacity of 53.6 cubic feet pales in comparison to rival crossovers. Behind the second row, the Compass' 22.7-cubic-foot cargo hold is also quite stingy. The 2016 Compass' 2.0-liter engine keeps the cost down, but it's rowdy, underpowered and not all that great for fuel economy considering its modest output. Remember, too, that if you can't drive a stick shift, you're stuck with the decidedly uninspired CVT. The 2.4-liter engine, on the other hand, has enough pep to keep up with traffic, and there's little fuel economy penalty compared to the 2.0, though refinement isn't much better. The six-speed automatic is a big improvement over the CVT, but it still shifts too slowly for our tastes. If you opt for the Freedom Drive II off-road setup, the CVT is unfortunately part of the deal. Ride quality is another weak spot for the Compass. The basic suspension design was sourced many years ago from the underwhelming Dodge Caliber hatchback, and it struggles to cope with today's well-worn urban roads. Expect a nervous, bouncy ride on such surfaces, with more impact harshness than you'll feel in most rivals. Handling is also below average, with an initial sense of control giving way to excessive body roll and vague steering in corners. At least you can do some respectable off-roading with Freedom Drive II, though other Compasses are unremarkable in this department.